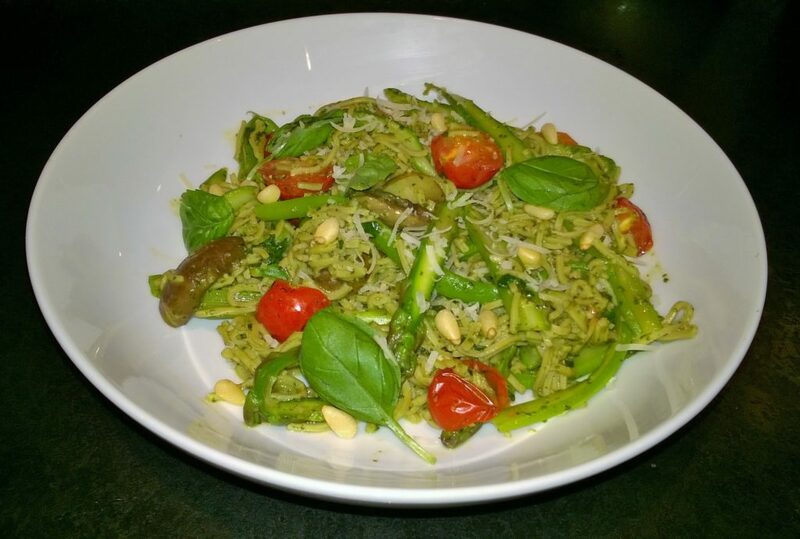 This is a quick dish which takes around 10 mins to prep and 5 mins to cook; perfect for a mid-week meal and with my homemade pesto it is also yummy. 1 On a high heat, in a saucepan of boiling hot water and a pinch of rock salt, add the organic edamame spaghetti and bring to the boil, then turn down to a medium heat and cook for 4 minutes until ‘al dente’. 2 Meanwhile, in a hot dry pan on a medium – high heat, add the mushrooms and cook for about 1 minute or until it has a little colour. 3 When the mushrooms have a little colour add the pesto sauce and mix before then adding the asparagus. Then mix it all together making sure it is all coated in the sauce and add 2 serving spoons of the water the spaghetti is cooking in to the pan, stir and cook for 2 minute. 4 Then add the spaghetti to the pan with the mushrooms, asparagus and pesto and add 1 serving spoon of the spaghetti water then stir. 5 Add the tomatoes, chopped basil leaves and the pinch of cracked black pepper and mix it all together cook for about 1 minute. 6 Plate up and garnish with the pine nuts, basil leaves and the Violife prosociano vegan parmesan, then serve. Chestnut Mushrooms can slow down the effects of osteoporosis. It is rich in copper and vitamin-B5. It also contains vitamin-B3, vitamin-B2, selenium important for cognitive function and a healthy immune system, anti-inflammatory, anti-fungal, anti-tumour properties and antiseptic which help keeps the body free from infections. Organic Edamame Spaghetti is gluten free and made from 100% edamame (green soybeans). It is also high in protein and high in fibre. Pine nuts contain mono-unsaturated fatty acids that help lower bad cholesterol. They are a good source of vitamin E, vitamin B-Complex, manganese, potassium, calcium, iron, magnesium, zinc and selenium. This is my favourite type of meal, tasty and packed with health benefits.